Our Beachy Christmas Themed Stationery Paper features a design for those who love the beach or who are from a tropical or warmer climate! 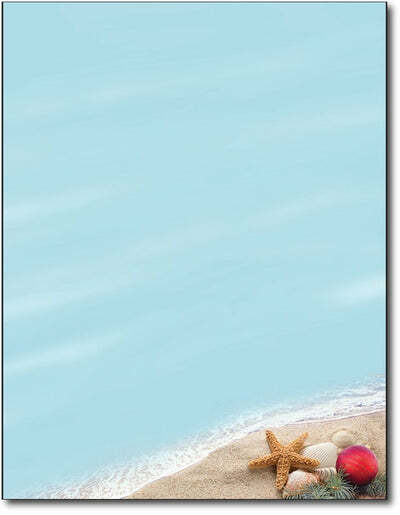 This holiday writing paper features a beach scene with a group of shells, starfish, Christmas bulbs, and pine needles in the sand. Use this letterhead to send your Holiday Party invitations or annual Christmas Letters! This holiday writing paper is made from a 50lb Text paper stock that is inkjet & laser printer compatible. Each stationery sheet measures the standard Letter size of 8 1/2" x 11".